The aim of the GRIA project has been to increase the usability of grids for businesses and industrial users. GRIA devised business models and processes that make it feasible and cost-effective to offer and use computational services, securely, in an open grid marketplace. Since GRIA was aimed at today’s business users, including HPC providers and SME clients, it provided solutions that can be used today, and which are based on proven, stable and secure technologies. 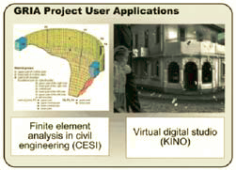 GRIA software has been tested using real industrial applications by the project’s commercial partners. Design and development of a computational workload prediction mechanism and for the job submission interface.